Are families, moms, and dads irreplaceable? Or is family merely a social construct that can be removed or changed at will to suit the agendas of those who wield political and cultural power at a particular moment in history? To help answer questions like this, Pearcey Report editor at large and best-selling author Nancy Pearcey will appear on film in some 700-plus theaters nationwide this coming Tuesday, May 6, as part of a new documentary titled Irreplaceable. Irreplaceable is a "special event in theaters nationwide from Focus on the Family," states Irreplaceablethemovie.com. 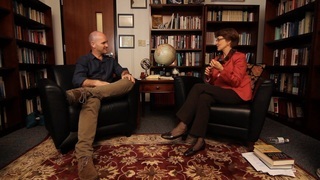 Nancy was interviewed for the film on the campus of Houston Baptist University, where she is a professor of apologetics and scholar in residence. Nancy has an honorary doctorate from Cairn University, and her next book is near ready to be sent to the publishers. Her previous books include Total Truth and Saving Leonardo. In this new film project, Nancy is joined by radio host Michael Medved, philosopher Roger Scruton, and other thought leaders, as host Tim Sisarich (in photo above) travels around the world to "find out whether the adage 'If the family fails, society fails' is actually true," states FathomEvents.com. "In their view of the family, Americans have been deeply affected by what is called social contract theory, propounded by thinkers such as Locke and Rousseau," Nancy states in an interview at The Family Project. "American conservatives tend to be influenced by Locke, while liberals think more along the lines of Rousseau. But in both cases, the heart of social contract theory is the idea that the ultimate starting point is the individual, the autonomous self," she explains. On this view, however, "where then do social institutions, like the family, come from?" she asks. Answer: "They are products of choice." Nancy argues that the "implications" of this view "are staggering. Social contract theory implies that we agree to be in relationships when they meet our needs. Relationships are essentially redefined as products of enlightened self interest. Thus if a marriage relationship is not meeting my needs, then I can choose to leave. If the origin of marriage is individual choice, then marriage is subject to the whim of the individual." No wonder," she concludes, "marriage has become so fragile in our day." In an article published at American Thinker and The Pearcey Report, I argue that marriage "has a normative meaning. It refers to the diversity of male and female, one man plus one woman, united in love, service, and commitment for life. Its merit derives not from tradition or from being a 'value preference,' a social construct, a belief system, or a crutch of the bourgeoisie." Rather, "marriage should be respected in terms parallel to the concept of freedom and unalienable human rights endowed by the Creator. Marriage is thereby recognized as an unalienable societal structure embedded by the Creator into the architecture of creation and into the essence of human nature. People who smash marriage end up smashing themselves as well, as does anyone who defies gravity by jumping off a cliff without a parachute." We would encourage you to consider seeing Irreplaceable. To find a theater near you, go here. Using the website's interactive map, I counted 12 viewing locations in the Houston area. And to buy tickets for this one-night event, go here.